The Council on East Asian Studies invites you to join Denise Ho (History) in conversation with Ned Cooke (Art History), Sergei Antonov (History), and Holly Stephens (Council on East Asian Studies) on her new book, Curating Revolution: Politics on Display in Mao’s China (Cambridge, 2018). 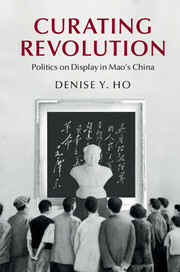 Denise Y. Ho is assistant professor of twentieth-century Chinese history at Yale University. She is an historian of modern China, with a particular focus on the social and cultural history of the Mao period (1949-1976). She is also interested in urban history, the study of information and propaganda, and the history of memory. Ho teaches undergraduate and graduate courses on modern and contemporary China, the history of Shanghai, the uses of the past in modern China, and the historiography of the Republican era and the P.R.C. She is the author of Curating Revolution: Politics on Display of Mao’s China (2018). Using a wide variety of primary sources, including Shanghai’s municipal and district archives and oral history, Curating Revolutiondepicts displays of revolution and history, politics and class, and art and science. Analyzing China’s “socialist museums” and “new exhibitions,” Ho demonstrates how Mao-era exhibitionary culture both reflected and made revolution. Professor Ho’s articles and reviews appear in The China Quarterly, China Review International, Frontiers of History in China, History Compass, Journal of Asian Studies, Modern China, and The P.R.C. History Review. Book chapters are included in Red Legacies in China: Cultural Afterlives of the Communist Revolution (2016) and in The Oxford Handbook of History and Material Culture (forthcoming). In addition to her scholarly research, Ho has been a commentator on contemporary China for The Atlantic, The China Beat, China File, China Policy Institute, Dissent Magazine, Los Angeles Review of Books, The Nation, and Origins: Current Events in Historical Perspective, among others. Current work continues Professor Ho’s interest in the material culture of the Mao era. She is also researching a second book entitled Border Crossings: Hong Kong and Shenzhen at Empires’ Edge. Denise Y. Ho received her B.A. in history from Yale College and an A.M. and Ph.D. in history from Harvard University. During her graduate studies, she was a recipient of a Fulbright Grant and a visiting scholar at the Shanghai Academy of Social Sciences. Prior to joining the history department at Yale, she taught at the University of Kentucky and the Chinese University of Hong Kong. She is currently one of twenty-one fellows in the Public Intellectuals Program of the National Committee on U.S.-China Relations.